Earlier this summer, a teaser page appeared at Socl.com revealing Tulalip, an oddly named service from Microsoft promising a new way to “Find what you need and Share what you know.” Facebook and Twitter sign-ins were offered, and the design was reminiscent of Windows Phone’s tiles. It turns out Microsoft has been testing this service with a select group of “friends,” and this week, I got an early look at Socl — “Tulalip” appears to be dropped — a curious site that’s coming out of the FUSE research group that will eventually be rolled out to the public. The site mixes search, discovery, and, go figure, a social network. How’s it hold up? Read on. Ignoring for the moment that the interface looks a lot like that other social network, Socl offers a bare bones, three column layout, with basic navigation in the left rail, a social feed down the middle, and invites and video party options (more on that soon) on the right. As usual, you can follow other friends, but you won’t find any list-making tools. Core to the experience is the large search field at the top that asks, “What are you searching for?” effectively creating a new type of status update. You can also toggle the field to a traditional status update. With Socl, you’ve got the option to post to your feed either a note that you’re searching for “live Prince covers” or that you’re ‘live at a Prince concert.” Entering a search term or status update drops it into your feed with appropriate Bing results, where your friends will have the option to comment, like, or further tag it. Clicking ‘tag’ adds the search term to your personal list of tags, and you can sort your friends’ searches and status updates by type (i.e. web, video, news, images). While tagging seems like a decent idea in theory — I theoretically want to track topics I’m interested in — I can’t imagine going back to a simple tag search for news, browsing, or much of anything, really, and Socl’s implementation doesn’t advance what Google’s doing with saved searches. I’ve got a mix of trusted friends, publications, and hundreds of RSS feeds to get a broad mix of focused news and information on topics I’m interested in, and tag searches for Politics, Film, or Technology, for example, aren’t going to offer much. And, there’s a big difference tagging an interest and actually searching. I might like the band Yo La Tengo, but I’m never searching only for that ‘tag.’ Instead, it’ll be a Google-ese mix like ‘yo la tengo scores ost 2008 album,’ which isn’t going to look good in any design and isn’t really relevant to me or my followers outside of last Thursday night. And then, seemingly out of nowhere, Socl also includes a video party feature, complete with chat, for watching YouTube clips together (currently no support for Vimeo, DailyMotion, or any other services). It’s a clean, intuitive UI, and aside from the lack of a controllable scrubber, it could be a fun service on its own. Socl is mostly built on HTML5 — we saw no instances of Silverlight or Flash — and the site showed no slowdown in Chrome or Firefox while video partying, searching, or tagging. I understand the push to make search a more social experience; Google’s been trying for months with the +1 buttons littered across search results that are then integrated into Google+. Let’s say you’re searching for great burrito restaurants in San Francisco Mission District. Traditionally, you might check Yelp (or a similar service), trusted friends, regular search, or a mixture of all three. And this side of social networking generally works; people ask for recommendations all the time on Facebook and Twitter, and you often get great answers that search simply wouldn’t have turned up. 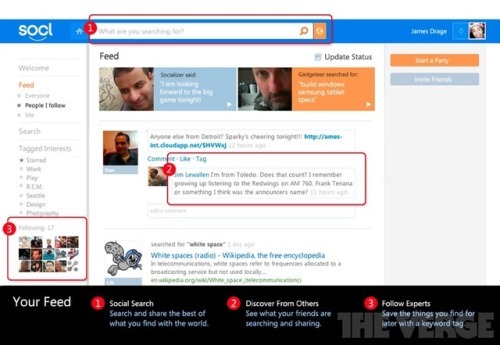 And, with social search, Microsoft is hoping that your friends will see your query and bring their expertise to it. Note that Socl is a research project, so it’s possible that it won’t ever get released as a mainstream product, but we’re hearing it’s still going to be tested publicly. Socl is starting late to the game, so it’s no surprise that you can plug into the potential traffic firehose that is Facebook. While all of your searches and tags are visible to your friends on Socl, I’ve been told your Socl activity can be limited via Facebook’s lists. Otherwise, there’s not much here in the way of interacting privately with other users on Socl; no private messages, no @replies, and none of the curated, semi-private groups like Google’s circles. Socl ultimately needs to better show how yet another social network and search tool can help users find the information they’re looking for; without mobile support or integration across the rest of the Microsoft world, Socl’s got a big hill to climb. We’re hearing Microsoft is nearing the end of its private testing period and will roll this out to a bigger public audience through an invite system.